Pepper spray floating in the air inside a hotel lobby in South San Jose prompted evacuations Monday morning, according to fire officials. Bob Redell reports. Pepper spray floating in the air inside a hotel lobby in South San Jose prompted evacuations Monday morning, according to fire officials. The incident was reported at the Extended Stay America along San Ignacio Avenue near Great Oaks Boulevard just before 5 a.m, fire officials said. It is not clear why, but someone sprayed pepper spray on a door inside the lobby, triggering a strong smell to fill the hotel's entrance, fire officials said. 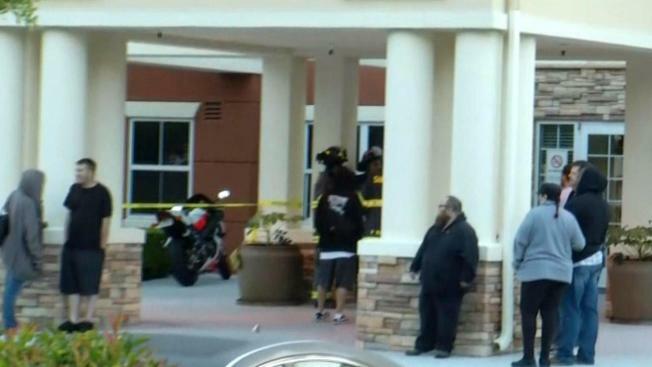 A hotel employee said the smell caused people to cough. Guests staying on the first floor were asked to evacuate the hotel, fire officials said. Residents on the second and third floors were prompted to shelter in place. One person was assessed by first responders, but that individual is OK, fire officials said.